GATE CSE 2016 Students did Better? Yes, GATE CSE students did much better compared to any previous year batch in GATE. First of all the 2 sets in 2016 were not easier compared to any paper before. Also, there were more number of numerical answer questions and aptitude questions of set 1 were quite hard. Moreover no “marks to all” was given unlike in 2012 where 14 marks out of 100 was given to all. In spite of all these GATE CSE 2016 students did perform much better and on average scored 5 marks more compared to those in 2015 as shown in below graph. 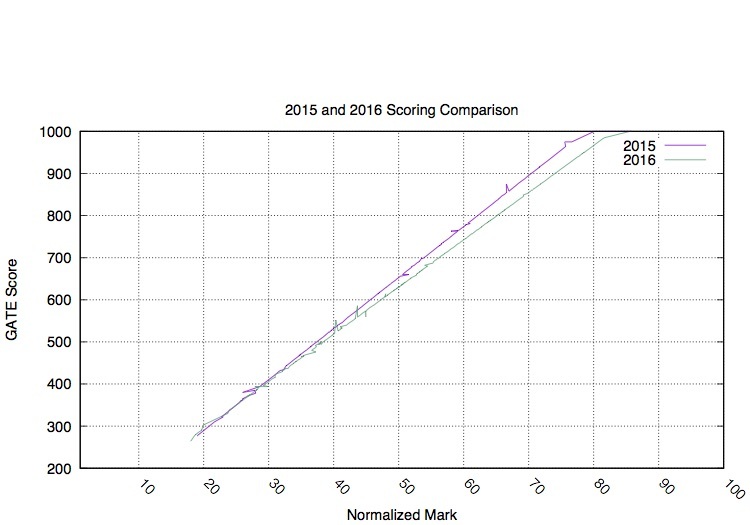 As seen in the graph- the marks in 2016 were more especially for those who scored high (60+). This shows that GATE CSE students have finally learned how to study for GATE using best resources and score high rather than just solving problems (without understanding theory behind) and getting 40-60. So, in future if you are not studying properly you have less chance of success in GATE CSE. This data also shows that GATE CSE students of 2016 are better prepared to tackle IIT interviews and hopefully there will be more admits this year as research admit numbers are mostly flexible.